Home » fallout new vegas , reviews , simon burdett , video games » It's a first for The Knight Shift! 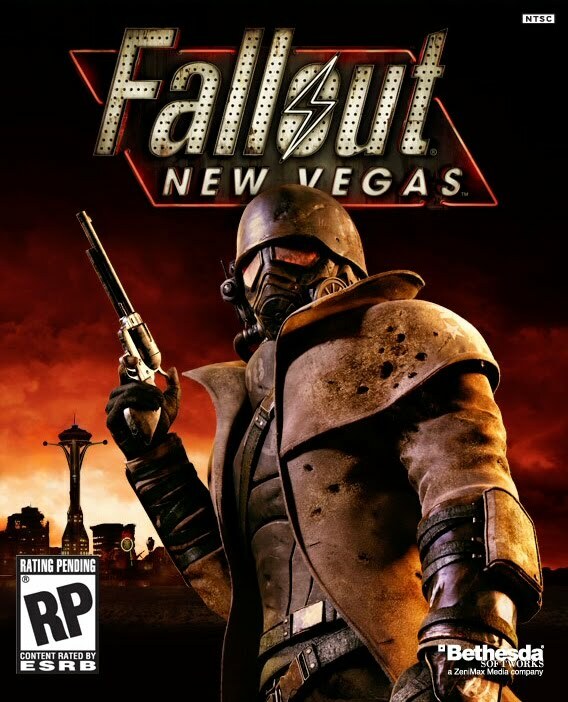 Guest blogger Simon Burdett reviews FALLOUT: NEW VEGAS! It's a first for The Knight Shift! 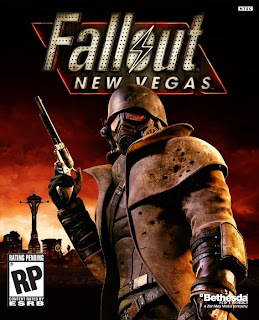 Guest blogger Simon Burdett reviews FALLOUT: NEW VEGAS! I can just hear it now: "Chris you've gotten lazy with your blog! It took seven years but you're finally all tapped out!" Linda Blair, eat your heart out. Awright then, 'nuff from me. Here is Simon with his review of Fallout: New Vegas! Towards the end of last year I spent some considerable time playing Fallout: New Vegas - the highly anticipated follow up to Fallout 3. What a frustrating experience it was. Fallout: New Vegas is set in the Mojave Desert where you are a courier shot in the head whilst in transit. You (obviously but simultaneously absurdly) survive and awaken in the town of Goodsprings and your quest for revenge begins. First off, this is spoiler free - I'm not going to delve into the main quest or the side quests as my gripes with this game don't actually revolve around the writing of the game. I bought Fallout: New Vegas purely on the back of Fallout 3. I was a late comer to the Fallout series and Bethesda's Fallout 3 was my first taste of the American Wastelands and was my first role playing adventure I had played in years. Fallout 3 was a regular fixture on my PS3 from 2008 up until October 2010 such was and still its appeal. Despite having completed the Fallout 3 on several occasions it didn't deter me from starting afresh. I found incredible longevity in Fallout 3. Fallout: New Vegas was lauded widely as being an incredible game but I beg to differ. I think reviewers praising it lost sight of the fact that they were essentially still playing Fallout 3. I will concede however that the writing in this game on the whole is better than Fallout 3 and there are some excellent additions in this game (the companion wheel, some nice new weapons and the impact of wearing faction armour on other factions) that ought to be imported into Fallout 4. Havoc: Fallout: New Vegas uses the same engine as Fallout 3 which was buggy as hell. It was a considerable source of frustration for the gameplayer when the game would freeze during VATS combat or as you were running across the map. Its simply ridiculous that Fallout: New Vegas should be WORSE for bugs. Obsidian's New guns and apparel: There are some nice weapons and apparel to choose from but there are some truly shocking examples of rushed production too. The highly desirable Ranger Veteran armour as shown on the box-art is a dreadful disappointment. Clipping issues when carrying rifles ruin its allure. The helmet optics seen in the demo/intro don't appear in the game. The armour offers no additional benefits either. The selling point during its teaser trailer days was this armour. Yet you may as well be dressed as Ronald McDonald for all the good its worth. Granted, this is a mere aesthetic grumble but it suggests the team designing the armour didn't capture its appeal from the intro. Some of the new guns have awful graphics, e.g. the 9mm sub machine gun and .357 Magnum in particular beggars belief. Its just not good enough for a next gen console. The Environment: For the most part the Mojave wasteland is well laid out. The map is clearly smaller than Fallout 3 but on first glance it only seems slightly smaller. The four corners of the map though are swathed by poor layout and actual design, yet I consider the most unforgivable environmental flaw the inexplicably inaccessible terrain in some quadrants of the map. It feels very annoyingly contrived that some destinations are only accessible through a designated route. Missing content: Specifically, The curious case of the BoS abandoned bunker. Perhaps this has been addressed or is being addressed but when I played it, I struggled to understand why this location was locked out of the game. Changes to gameplay: XP. Regardless of difficulty the XP is always the same - playing on very hard difficulty no-longer feels rewarding. Indeed playing on very hard is tantamount to insanity if you're building a melee or unarmed character. Obsidian wanted to make Fallout: New Vegas more challenging, clearly seeing the gradual increase in potency of the bestiary a mistake in Fallout 3, so right from level 1 apex predators roam the wasteland. Its sheer folly attempting to fight Cazadors, Giant Radscorpions or even Deathclaws at early levels armed only with a 9mm pistol (and a wing and a prayer) and utterly ridiculous. The most obvious route to New Vegas places many apex predators in your way. Some may think this is clever. I consider this lazy programming coercing the gamer into playing the game the programmer's way. The Casinos: Ok, a slight quibble but the main drag of New Vegas has 4 casinos and of which one isn't operational. For a game called "New Vegas", there is paucity to its focal point. Fallout: New Vegas for all its good points is Fallout 3 but minus the charm. When I read Fallout: New Vegas was what Fallout 3 was meant to be I appreciated what Bethesda had done with Fallout 3 so much more. My lasting impression of Fallout: New Vegas is of a rushed venture. It made some nice tweaks but ruined character development, idiotic decisions such as reducing perks and amount of skill points accrued per intelligence quota destroyed the fun in leveling up. A decent storyline butchered by a poor development team. Bethesda can't develop Fallout 4 soon enough. God (and Chris) willing see you again in February! I'm still looking forward to getting more into Fallout: New Vegas, but what Simon is reporting has been echoed by a lot of people. Let's hope that Bethesda and Obsidian get on the ball and patch things up and soon. I'm afraid I must disagree. I've played through F:NV twice, and have encountered only avery few minor bugs. Besides that, I have found the writing--both the overall story and the dialogue--to be *vastly* superior to that in Fallout 3. The weapons also seem better designed. Just my opinion, obviously, but for what it's worth I've enjoyed New Vegas waaaay more than I did F3. Thats fair enough - I wouldn't disagree with you regarding the writing, I mentioned I thought the writing was superior - but I disagree regarding the weapons. Some looked poorly designed and the game lacked the charm on Fallout 3 in my opinion.